Image caption ERT ran three domestic TV channels, four national radio stations, as well regional radio stations and an external service, Voice of Greece. Greek PM Antonis Samaras has said a small number of people could be hired to produce news and current affairs programmes until a new public service broadcaster is set up. He has been heavily criticised for ordering the sudden closure of public broadcaster ERT. The offer of a concession follows pressure from the PM's partners in the coalition government. ERT's sudden closure is part of the drive to cut government spending. The government said the closure was an essential measure to help meet the country's debt bailout obligations. It described ERT as a "haven of waste" and said it would relaunch it as a smaller, independent public broadcaster. Mr Samaras is due to meet his coalition partners on Monday to discuss the issue. He wants the replacement broadcaster to be established by the summer. The European Broadcasting Union (EBU) has called on the Greek government to reopen ERT. A petition signed by 51 European directors general, including the BBC's Tony Hall, is to be handed over to the Athens government. 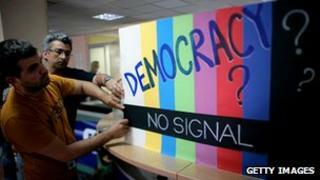 The EBU called the government's action "anti-democratic" and "unprofessional". Viewers watching the news on the main ERT TV channel saw broadcasting cease late on Tuesday evening. Journalists however refused to leave the building and online and satellite broadcasts are being maintained with the help of the EBU website. ERT, which began broadcasting in 1938, was funded by a direct payment of 4.30 euros (£3.80) added monthly to electricity bills. It ran three domestic TV channels, four national radio stations, as well regional radio stations and an external service, Voice of Greece. Since its sudden closure, nearly 2,700 workers have lost their jobs, but they will be able to apply to work for the new corporation. Employees have protested outside the building since Tuesday and the closure also sparked a 24-hour general strike in the country. The Greek government has pledged to cut thousands of public-sector jobs in order to receive billions of euros in rescue loans from the European Union and International Monetary Fund.